 and many kathas later, O devi vouched Shiva any being that attains to this station to which you are primal witness, shall be granted the Amrita. This was the divine prelude to AMARNATH. Shiva had asserted that the whole world is his playground, every place is pervaded by his divine essence, and yet, there are places where this divinity is more clearly perceived, places where the individual's consciousness is uplifted spontaneously into universal being. Places, where yogis and bhaktas have meditated and done tapas, in order to get closer to the pristine truth. And these are stations which do give the feel of the truth. And Amarnath where the whole truth had been expounded by the NATH himself is an extremely powerful station, still vibrating with the divine essence of existence, still echoing Shiva's words and Parvati's love ....still remaining the fountainhead of all life. And so, the Rishis went for darsana, the siddhas went, the sadhs went, the naths went, the kulas went, the sants went, and went so many other blessed ones. So many went like a backward flow of waters, back to the origin, and felt for themselves the presence of the perennial source. So many sang prayers, gave offerings, meditated and then came back home to tell the others stories of AMAR NATH, the master storyteller. Till today Amarnath stands as a colossal sanctorum. Till today we team up every year, to go for the yatra - holy trek to have darsana of the lord's symbol in its pristine glory. And the numbers grow .But the enigmatic Shivlinga waxes into fulfillment in a phase, or wanes into disappearance in another, and we all want to witness it in its purna avastha. And this desire becomes a great platform for Shiva's Leela. Our aspirations give way to the lord to enact his play! He is a great performer, HE is Natraj. And when he has a devoted audience, you can be sure that the play is in full swing, and not only is Shiva present, He is dancing.....and the happy bhaktas can feel His dance in their own ....they are sure of His presence much before they reach the cave. Sure that He has been with them from the first steps of the yatra....and when they reach the top and see the Shivlinga for themselves, it is a great fulfillment. And this goes on and on, and more and more bhaktas have darsana, go home, pass the word, and yet more people join the yatra, and this goes on happily. And then, suddenly, news comes that The Lord has disappeared. This is an abrupt change of scene. It is disappointing, there is sadness. What has happened? Where has Shiva gone? Volleys of discussions begin, why has he gone? Who is responsible? Who is irresponsible? Has something annoyed Him? And these debates are happening mostly in places far from Amarnath itself .. and as the scene shifts from the mountain to our discussion armchairs, so does our focus. 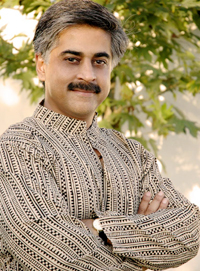 We get more involved in intellectualism, we remember to blame, but forget the game! We begin to forget that all is Shiva's Leela, all is the play of Natraj, we begin to forget Natraj Himself! This is to be noted, we actually are forgetting Shiva when we are animatedly arguing about him. We forget that he can take care of his own schedules, we forget that even in the Puranas one of His chief characteristics is to appear and disappear at will. We forget that this is the same Shiva who can mesmerize the doubting by snowing Hairat (astonishment) into Shivratri! We forget that we at our best are custodians of faith, not just of symbols. We forget that seeing always is not the only believing. Sometimes, it is believing that enables "seeing". We even forget that Amarnath, the very epithet of lord Shiva means, the Nath always exists! And happily, far from the television arguments, there are still thousands who are climbing each day to "see' their beloved Nath, even if He Appears not to be there. This is real spirituality, to have faith that God always is, even if He Appears not to be there. This to be noted, it is not a disappearance of Shiva, but his appearing not to be there, where he always is! He is everywhere, but in our discussions, we forget. Throughout the ages, the Lord has always been. 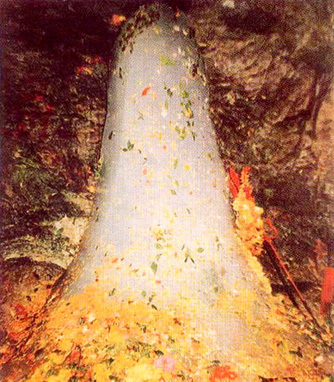 In Amarnath the Shivlinga always comes, sometimes it disappears; much like the enigmatic moon that being always full, appears to wane, whereas it is actually nested in the lord's matty hair! Sometimes, as we all in J&K should know too well, even the cave is lost, till the lord wills that it be found again. It is all the Lords will. We are but finders, discoverers, faithkeepers. Some keep the faith by praying for Shiva to show his Shivling, again. Some keep the faith by going on climbing regardless. Some do keep the faith by trying to have meaningful discussion for the future, some keep the faith in their heart. And I am glad some keep the faith by planning for, tending to and feeding and then cleaning the disposals of the ever-growing numbers of pilgrims, regardless of any distraction or detractors. It is good that some assist Shiva by serving his Bhaktas. He does not need anything from us, but this is our chance to participate in the Leela as attendants, so we offer in the spirit of "Tera tuj ko arpan". And as one of those who have known Shiva intimately in meditation, I am glad that people with senior temporal positions have risen to the occasion and made arrangements for our guests who come from far, and the numbers will grow. And I am glad we have some administration in place to be around, for Amarnath will not only continue to abound for bhaktas in India, but there will be a day when it will be a great pilgrimage destination for seekers all around the world. In mundane terms, it has the potential. When this happens, is of course Shiva's will and when He chooses, He may appear in the form of the most magnificent Shivlinga. We will wait in large attendance.